I have so many framed things at my house and not enough wall space I might just have to start layering like they did here. I'm really liking the layered look lately. I love the look, beautiful. You want to have your favorite art so that you can enjoy every day! yes yes, I love the whole room!! Love this! Looks great! Love the white orchid too. LOVE it! I've yet to do it but I LOVE it! I love the look and have done it, but it's difficult because you are inevitably covering up part of the piece of art or photo. And I love all my art - I hate covering any of it up! oh yes! its one of my favorites.....esp with photos. I adore this look, rich and interesting...collections over time. I love this look, and what I love best about this photo is how they have layered the flat screen in there too. I think it's hard to make a flatscreen look "good" or hide it so this one does a pretty good job of making it mesh in nicely and sorta disappear a bit. like! 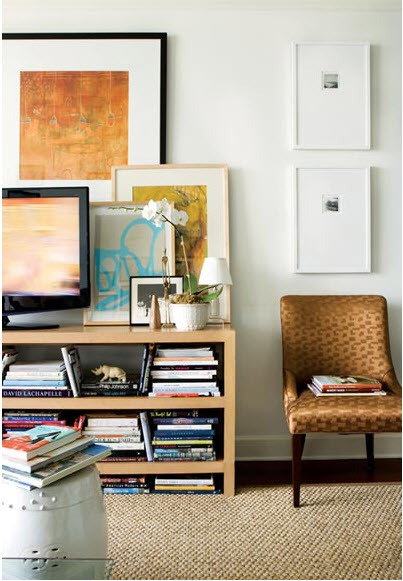 I was just noticing some good examples of layering artwork in the new Apartment Therapy book last night, I love the look -- and its a great use of space! When you only have so many places for frames it's a great way to use a bunch in one spot. I am going in week after next to negotiate an offer from the BAC:) we'll see. Love it! I'm a huge fan of layering. My entry table is acutally layered this very moment because I haven't decided where to hang a piece art. It's probably going to stay like that for a while because I like it so much. Yes I am a huge fan of layering. yup, i agree. it looks more collected over time than intentional. go for it, hun! What a great problem you have to have too much art and not enough wall space! I think that is my dream. Love the layered look...can't wait to see what you do! I think every well designed space is layered. Layering can be so beautiful when done correctly like the photo you posted above. I think the key is to just see enough of each picture to grab your interest! great post topic! Ah yes, for sure loving this look. I do really like this look!